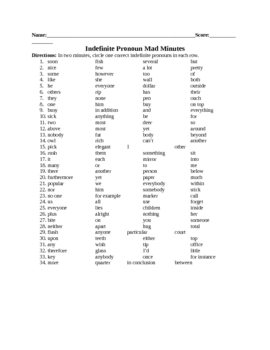 This is a quiz/worksheet activity that is fashioned after a Math Mad Minute. Students from 6th thru 12 need to know the grammar concept of an idefinite pronoun for the CAHSE test. It is also tested on the CST. This tool helps students to take the first step in recognizing an indefinite pronoun.